Paramedics provide pre-hospital emergency care, treatment and specialised transport for patients with medical emergencies. They also deal with non-emergency tasks such as hospital admissions, discharges and transfers. They usually work as part of a rapid response team dealing with a range of situations, from minor wounds to serious injuries caused by a major road or rail accident. performing daily vehicle and equipment checks, making sure that medical supplies are accounted for and that equipment and ambulances are working. Why did you choose this profession? I am a bit of an adrenaline junkie and in this profession you get a lot of that! Although I must say, it’s not just about lights and sirens – you get the chance to save lives and make a difference when most needed. What training did you undergo? I did six weeks’ Basic Life Support (BLS) training to become a Basic Ambulance Assistant (BAA). 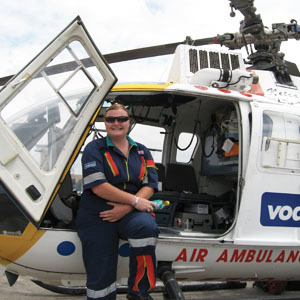 Thereafter, I had to work 1 000 hours on the ambulances and had to be registered for a year with the Health Professions Council of SA in order to study Intermediate Life Support (ILS) to become an Ambulance Emergency Assistant (ANA). What characteristics do you need? Having the right personality is very important. You have to be caring, loving, patient, always in control of your emotions, and you must be able to work in stressful situations and handle all types of people. Is experience as important as formal training? Both are very important. You have to have the knowledge to be able to treat your patients – so in that respect, the academic side is just as important as the practical phase. Experience comes with years of practise and treating many patients. In the emergency medical sector you, as a practitioner, can never know enough. Therefore, continuous studying is vitally important. Describe a typical day on the job You work 12-hour shifts, day or night. You arrive at base (normally situated at a hospital) and then you and your partner start cleaning the ambulance, checking all the equipment and making sure enough medical stock is available in the ambulance. Then you wait for the control centre to dispatch you to a call. In other words, you wait for your phone to ring with someone needing your help. Then you get there as quickly as possible, realising that every second counts – often putting your own life in danger to be there for someone needing your help. What do you like most about your work? Being able to give comfort to people who are hurt and scared. Holding a patient’s hand and telling him or her that they are in safe hands. Knowing that I can make a difference. Which aspects of the job are you least enthusiastic about? Seeing people die due to speed, alcohol and negligence. It’s always heartbreaking to see kids die, no matter what the cause is. What’s been the highlight of your career so far? To me, every single day spent on the job is a highlight. This is my passion and I really love being an Ambulance Emergency Assistant! Every time I get to help save a life makes the job worthwhile. What are your future goals? Studying Advanced Life Support (ALS) and then hopefully becoming a Paramedic (ANT) in the near future. What advice would you give to someone starting out in your field? If you are sure that this is what you want to do with your life, try to get an opportunity to observe paramedics at work. Thereafter, get your BLS qualification and apply for a position on the ambulances. Use the opportunity to learn as much as you possibly can from the senior staff you work with, ask questions and work extremely hard. This job is truly rewarding. One route to becoming a paramedic involves three levels of training, with a theoretical and practical component to each. The first level is Basic Life Support (BLS) course to become a Basic Ambulance Assistant (BAA), the second is the Intermediate Life Support (ILS) course to become an Ambulance Emergency Assistant (ANA), and the third is the Advanced Life Support (ALS) course, which qualifies you as a Paramedic (ANT). An alternative route is to enrol for a Bachelor of Technology: Emergency Medicine or Emergency Medical Care, which is offered at various universities and universities of technology. Graduates must then register with the Health Professions Council of South Africa.